What is a 401K ? 401(k) is a type of retirement savings account in the United States, which takes its name from subsection 401(k) of the Internal Revenue Code (Title 26 of the United States Code). A contributor can begin to withdraw funds after reaching the age of 59 1/2 years. (See subsection "Withdrawal of funds" below for restrictions before that age.) 401(k)s were first widely adopted as retirement plans for American workers, beginning in the 1980s. 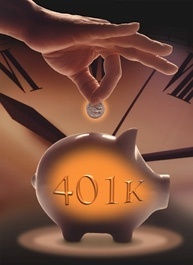 The 401(k) emerged as an alternative to the traditional retirement pension, which was paid by employers. Employer contributions with the 401(k) can vary, but in general the 401(k) had the effect of shifting the burden for retirement savings to workers themselves. In 2011, about 60% of American households nearing retirement age have 401(k)-type accounts.